That blue hedgehog is back for more fun on Nintendo systems with the upcoming Wii U and Nintendo 3DS exclusive Sonic: Lost World. What has been revealed so far seemed promising, but does it continue to live up to SEGA’s promise to bring Sonic back to form? The Wii U demonstration consisted of a few selected acts that have been doing the rounds at press events in recent times. It was possibly to play through the initial Windy Mill Act where players are taught some of the basics. What is clear from the start is the focus on having various areas to explore. It was nearly impossible to attempt searching every nook and cranny for collectibles. Fans of those illusive red rings will no doubt like the fact that they are also in this new Sonic adventure. Anyone else who is just interested on speeding through the acts can still look forward to all the challenges provided. The act itself was designed so that players could take advantage of Sonic’s abilities to explore every area. Only those that made use of such abilities as the boost could then get to higher places and so on. It’s a risk worth taking so that Sonic can reach some of the areas. Being able to do so after a few attempts resulted in feeling rewarded for the effort. There is no stopping Sonic and his powerful spin dash. The boost ability itself isn’t new to this adventure, but underwent some changes. It doesn’t seem like there is a limit to its use – like in previous Sonic games where energy was required. Instead the true challenge is being able to control Sonic whilst attempting to steer and avoid any obstacles or traps in the way. The sheer speed of the hedgehog was enough to warrant stopping on a few occasions where it was necessary to change directions. There were also a few times where Sonic fortunately grabbed on to platforms and avoided certain death. 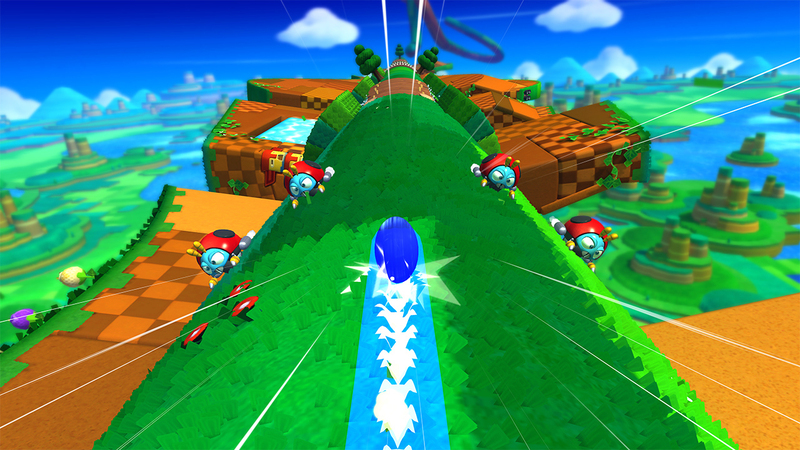 Sonic is also automatically steered in the right direction, as seen on a few occasions whilst playing, to ensure that the player could appreciate the view. As usual, the camera is still a bit of an issue. For example, here were times where it felt like it became difficult to see further ahead whilst using the boost ability. Initially, it is also somewhat disorientating to navigate around in the 3D environment as Sonic. The camera seems to rotate around the platform rather than Sonic. It gives the sense that Sonic is being pulled into these planet/asteroid like platforms – which makes sense since the theme seems to revolve around the concept of strange worlds. The camera style also makes the task of learning the controls a bit daunting on the Wii U. There is an initial fear that Sonic will fall during the first few times jumping between platforms.. Fortunately the various tutorials and fail safe mechanics – use of springs to keep Sonic from falling – ensure that it was possible to eventually get to grips with the controls. 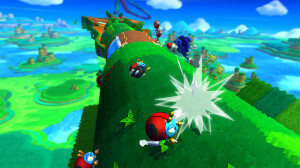 Further in the level there are other ideas implemented to possibly test if players are ready to face the real challenges ahead in Sonic: Lost World. 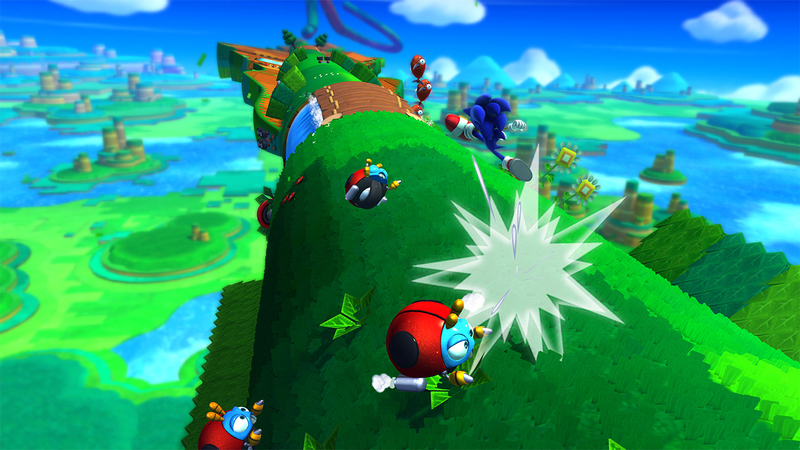 Sonic had to use the boost ability to avoid falling down crumbling platforms. He also had to make use of wall running to get to the end of the act. It was tricky and did result in dying a few times, but it felt satisfying to eventually get through this wall running section. Sonic homing in on an enemy. Attacking enemies consists of either using the spin dash, which is actually quite amusing to witness in this Sonic adventure, and the homing attack. It’s a strange decision to not have the homing attack activate when pressing the jump button again whilst jumping. But it does mean not moving Sonic forward by accident with the homing attack. It’s another case of a change in how Sonic is usually controlled that eventually makes more sense after playing through the whole act. One of the best aspects is the use of familiar features from previous Sonic games. There are various capsules (filled with animals) found scattered around the act. Breaking one of these releases the captured animals and will probably result in fans of the older Sonic games giggling as they fondly remember doing the same all those years ago. Watching others play some of the acts in the demonstration also brought back certain memories. An act set in a casino involved Sonic running around a brightly coloured section that was reminiscent of Sonic’s misadventures with pinball tables in some of his other adventures. This act also showed more complex game mechanics – such as a section where Sonic had to hit what looked like switches in a specific way to progress further on. Sonic games are well known for making good use of colour and Lost World is no exception. Vibrant backgrounds occupied most of the screen. It was difficult not to not focus on the detail given to everything on display. If there was something that Sonic: Lost World didn’t lack was giving the player a view to remember. The concept of an act that is made up of smaller platforms works really well. Specially as the act played was designed in such a manner that it felt like it was some sort of theme park ride. It’s the sort of design that will make players eager to see what other crazy worlds Sonic will speed his way through. The GamePad was used mainly as a way to see progress for the act being played. A wise decision given the fact that making the player constantly look at the screen would have surely resulted in dying a lot. The Wisp colour powers are activated by the GamePad, but it wasn’t possible to personally try this function. However, if it is anything like the 3DS version, then it’s very easy to use Wisp powers since it merely requires touching the screen or making a swipe motion. If anything, using a touch screen resulted in more accurate outcomes, when using the powers. It’s disorientating to get to grips with the controls at first, but some of the decisions taken made sense towards the end of the act. If this is anything like Sonic Colours, then players are in for a treat. It felt like the sort of experience that became easier to understand once the various changes in design began to sink in. If anything Sonic: Lost World was a please experience and one that certainly proved SEGA’s commitment to improve the hedgehog’s popularity. If it manages to keep up this momentum throughout the remainder of the story, then SEGA is most definitely onto a winner that could also possibly benefit Nintendo and its Wii U hardware.